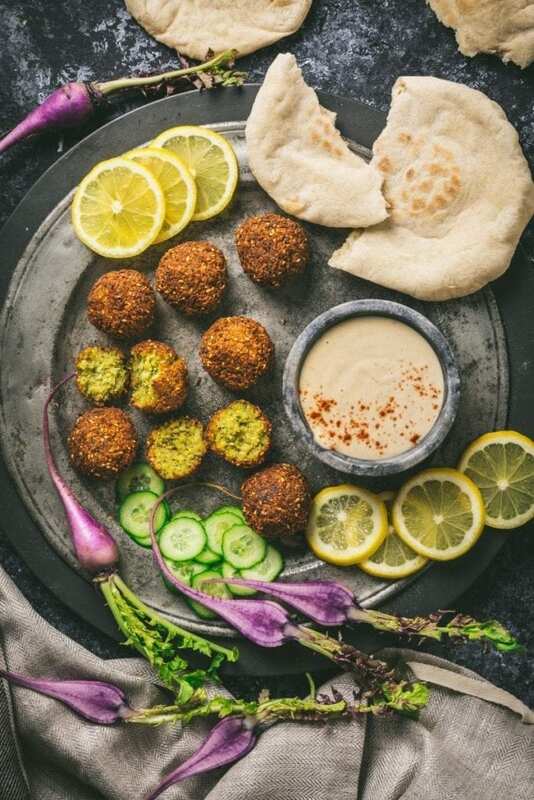 Falafel – crispy fried nuggets of ground chickpeas, flavored with herbs and spices – are an essential Middle Eastern dish. Serve them as a meze appetizer with Lemon-Garlic Tahini Sauce, or stuff them into warm, home-made Pita Bread with a veggie salad. All right, we’ll admit it: we’re unapologetically carnivorous. I mean, we’ll try anything, more or less, but when it comes down to “what to make for dinner”, at least a few times a week our protein of choice will be some kind of meat, hopefully raised and butchered responsibly, but still animal. And those of you who’ve been following us for a while know our shtick: we’re not adherents to any one particular diet or another, we don’t do paleo or Atkins or South Beach or whatever, we’re just home cooks who swear a lot and occasionally drop whole dishes of cauliflower cheese on the floor. But we do love vegetables, and the environment, and we also have friends who are vegan, or gluten free, or both, and who will squint and poke us in the ribs from time to time and say “What about me, bud? What about me?” These falafels, my friend, go out to you. 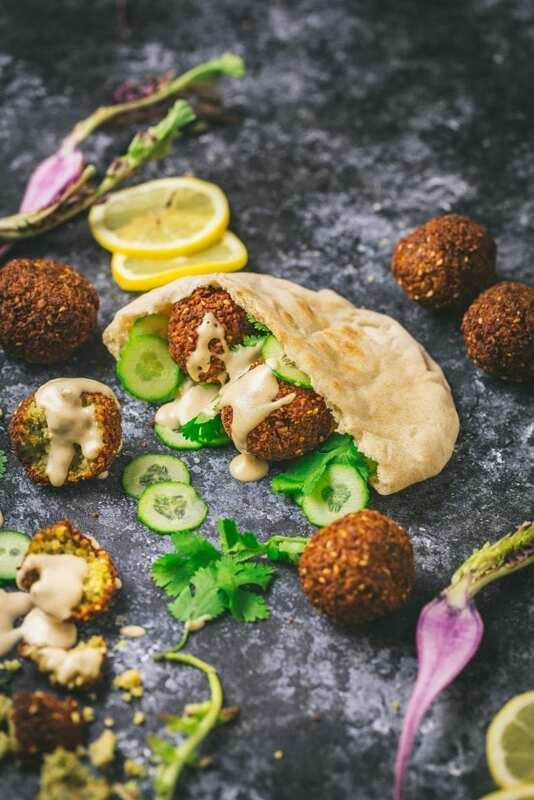 I don’t know why it took us so long to blog a falafel recipe. Emily grew up going to Mamoun’s (the best falafel joint in NYC), and her college years were spent bunked up with vegetarians, Moosewood cookbooks and, frankly, a severe lack of funds. This gave her a pretty good foundation in the dishes that could be put together with varieties of grains, beans and rice. And Matt rarely meets a bean he doesn’t like, but is frequently disappointed by boring veggie burgers. But these spicy deep fried delights? Yeah, these tick all our boxes. While the dried chickpeas require an overnight soak, and the mixture has to chill for a couple of hours, the rest is easy and actually a lot of fun to make. And the good thing is, you don’t even need a deep fryer. 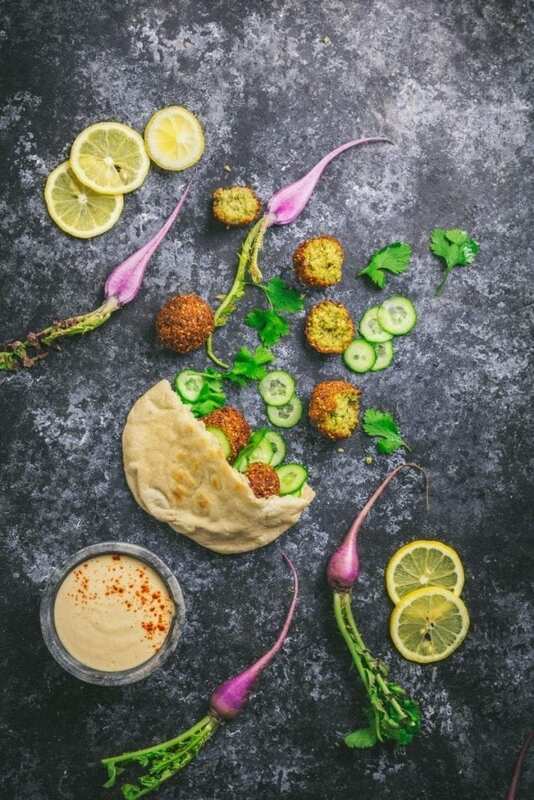 The beauty of falafel lies in its texture: crispy, craggy shell encasing a delicate, herb-flecked ball of pillowy ground chickpeas (also called garbanzo beans). We keep our recipe quite traditional, but add a few touches of our own; sesame seeds in the mix add extra crunch, a little baking soda helps keep the fritters light. We like a lot of fresh herbs in the mix. A combination of parsley and cilantro is what we go with but mint would also be great. Even basil would be a tasty variation. The process is very simple. Soak the dried chickpeas overnight in a bowl covered with at least 3 or 4 inches of cold water. The beans will almost triple in size so make sure to use a big enough bowl. Don’t use canned chickpeas. They’re precooked and will turn to mush. Once they’re soaked, drain them well and add them to a food processor along with the roughly chopped onion, herbs, scallions, garlic, flour (for gluten free falafel, use chickpea flour), cumin, coriander, salt and pepper. Pulse the mixture, scraping down the sides every few presses, until it looks almost like cracker meal or couscous. You don’t want it to turn into a paste but you don’t want it too coarse either. We found about 20 3-second presses got us there but your machine could be different. Just keep pulsing, scraping and checking until it looks right. It should just hold together if you squeeze some in your fingers. Transfer the mixture to a bowl, cover it will plastic wrap and chill it in the refrigerator for 1 to 2 hours. Once the mixture is chilled, dissolve baking soda into 2 teaspoons cold water and stir it in. This step is optional but it helps keep the falafel light and airy. Mix in the sesame seeds. Now you’re ready to form the balls. We found that 1 1/2 tablespoons (about 40g) were the perfect size but you could make them smaller or larger if you wanted. You could also form them into a patty shape rather than balls. They’ll be delicate at this stage and may want to fall apart but just be gentle but persistent (this is also just good general life advice). They’ll firm up and become sturdier as they cook. Look at those lovely balls! Now you’re ready to fry. Heat about an inch of neutral vegetable oil in a heavy-bottomed deep sided skillet. An 8 or 10-inch cast iron skillet is perfect for this, but you can use anything, including a non-stick pan, as long as it’s not too thin (thin pans heat too quickly and would likely scorch). 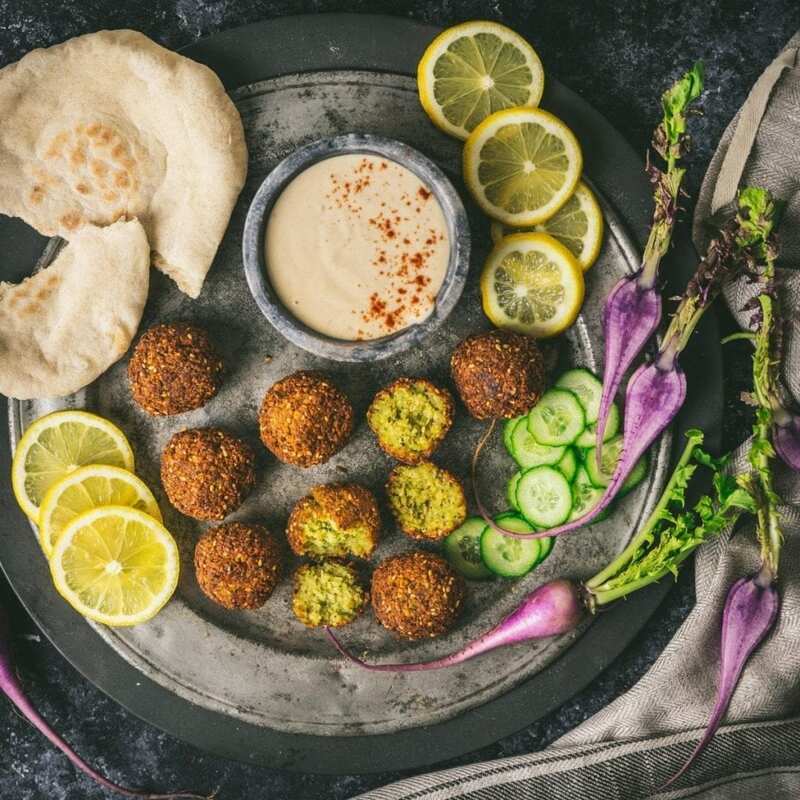 The optimal temperature for frying falafel is between 360ºF and 375ºF. If you don’t have a thermometer (get one, they’re awesome! ), you can use the bottom of a wooden spoon to test. Lower the tip of wooden handle into the oil and if the oil around it bubbles vigorously, it should be hot enough. 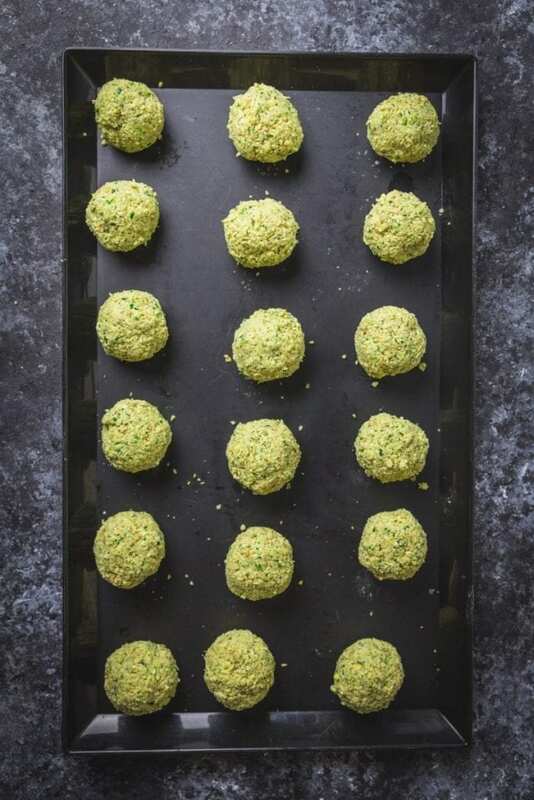 Carefully lower a few of the falafel into the oil, leaving plenty of room between them, and cook until crisp and deep brown on one side, about 3 to 4 minutes. Then gently turn and cook the other side, 2 to 3 minutes. Remove to a paper towel-lined plate and sprinkle lightly with kosher salt. Repeat the process until all the falafel are cooked, adjusting the heat to ensure the oil temperature stays as even as possible. Serve them with the most delicious (and incredibly easy) Lemon-Garlic Tahini Sauce, as well as store-bought or homemade Pita Bread. You can stuff them in a Pita sandwich or serve them meze-style, on a platter, with plenty of fresh vegetables along side. Since it’s still winter here, we served ours with beautiful purple radishes, fresh cilantro and sliced Persian cucumbers but in summer, sliced or grape tomatoes would be fantastic. Thinly sliced cabbage (red or green) would also be delicious in the sandwich, as would shaved red onion, bean sprouts, thinly sliced carrots. Really any crisp vegetables you like. Rinse chickpeas, place in a large bowl and cover with at least 3 inches cold water. Cover and let stand at room temperature overnight. They will almost triple in size so you will have about 4½ cups. When ready, rinse and drain well. To the bowl of a large food processor, add chickpeas, onion, herbs, scallions, garlic, flour, cumin, coriander, salt and pepper. Pulse the mixture, scraping down the sides every few presses, until it looks almost like cracker meal or couscous. You don't want it to turn into a paste but you don't want it too coarse either (approximately 15 to 20 3-second pulses). Just keep pulsing, scraping and checking until it looks right. Transfer mixture to a bowl, cover with plastic wrap and place in refrigerator for 1 to 2 hours. After mix is chilled, dissolve baking soda in 2 teaspoons cold water, and stir into the mixture. Stir in sesame seeds. Scoop out about 1½ tablespoons of the mixture and gently shape it into a ball and place on a tray. Continue until all of the balls have been formed. Fill a deep 8 or 10-inch cast iron skillet, nonstick skillet or Dutch oven with 1 inch of oil. Heat over medium-high heat until oil registers 375°F on an instant-read thermometer. Carefully lower a few balls into oil one at a time, allowing some room between each. Adjust heat as necessary to maintain an even temperature and allow to fry, undisturbed, until well browned on the bottom, about 3 to 4 minutes. Then carefully turn balls until browned on the other side, about 2 minutes. 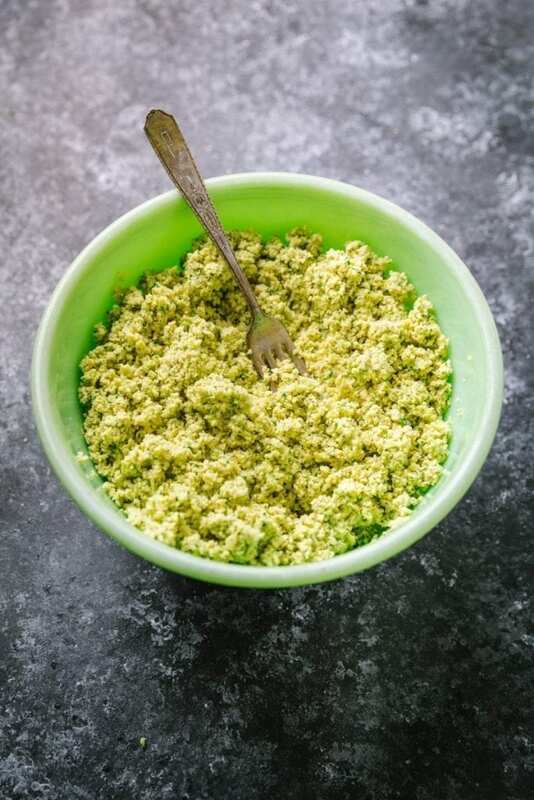 Transfer cooked falafel to a paper towel–lined plate and season lightly with kosher or sea salt. Repeat with remaining chickpea balls. Serve hot with Lemon-Garlic Tahini Sauce on the side, or stuffed into Homemade Pita Bread. Your photography is spectacular. Thank you for a deliciously inspiring post. Can you freeze these?? If so, do I fully cook them, THEN freeze or before frying? Hi Caroline, we froze some after frying and reheated them on a sheet pan in a 250ºF oven for about 20 minutes. They were good. Not quite as good as right out of the pan, but definitely tasty. Do you think they could be baked instead of fried? Thanks so much! I haven’t tried baking them but here’s what I would do. Make the balls into patties so they have more contact with the heat. Preheat oven to 375ºF. Lightly oil a parchment-lined tray and place the patties on, then brush each with a little oil. I think they would need to bake for about 20 to 30 minutes to get crisp and cooked through. Flip them halfway. If you try it, let us know how they turn out! Hi! My family loves this recipe! Thank you for sharing. I would like to report that baking the falafel at 375 for 25 minutes worked perfectly to achieve crispy toasted outside pieces. I used a tablespoon as my mold and inverted onto parchment, then brushed lightly with olive oil to help brown the tops. The falafel turned out PERFECT! So delicious! Don’t know what I did wrong but the balls broke apart in the hot oil. Any ideas?